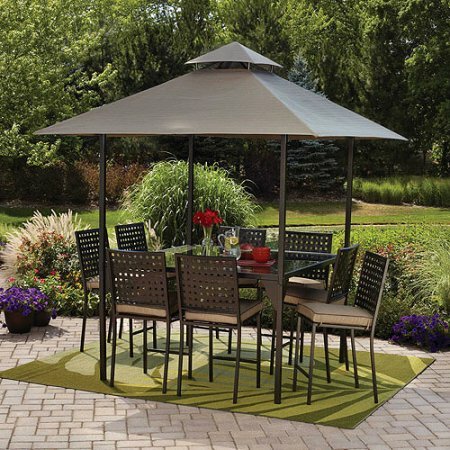 Deal Shopping Mama: Walmart: Mainstays D'roma 10-Piece Gathering Height Patio Dining Set, Seats 8-$460 SHIPPED! Walmart: Mainstays D'roma 10-Piece Gathering Height Patio Dining Set, Seats 8-$460 SHIPPED! This dining set will make you never want to leave your backyard oasis. This decorative and comfortable set includes eight dining chairs and a counter-height table with removable canopy. This set features durable, powder-coated steel frames, so you will enjoy this outdoor set for years to come.